On the Site Widgets home page, select the Domain Blacklists button in the right corner. Blocking by Tag Template allows publishers to mass block batches of content tags based on a regularly updated and audited list. If you are interested in Blacklisting by Tag Template, please contact your Account Executive for more information. Choose to apply the same content blacklists across all of your domains by entering blocks in the All Domains field. To blacklist content on an individual site only, add blocks in the field of your desired site. You can search for a specific domain in the Filter Domains Search. Select +Tags for a pop up menu of content tags to appear. Select +URLs for a pop up menu to enter a specific URL. To blacklist content, simply select the content you do not want shown on your site’s widget(s). Content tags are in alphabetical order. You are also able to search by keyword in the Search Tags Bar. 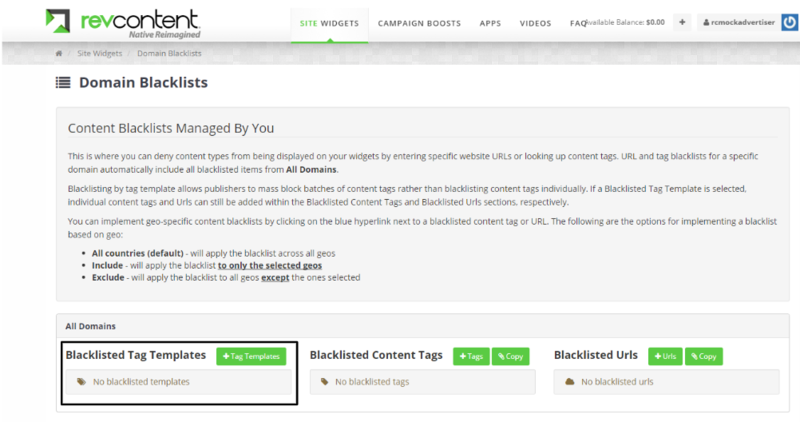 Your selected content blacklists will appear on the Domain Blacklist homepage. Please allow up to 30 minutes for content blacklists to take effect. You can add or remove content blacklists at any time. Enter the URL you would like to blacklist in the Add URL field. Your selected URL blacklists will appear on the Domain Blacklist home page. Please allow up to 30 minutes for URL blacklists to take effect. You can add or remove URL blacklists at anytime.